Credit: Montserrat Roca Marti. Download this image (JPG, 440 KB). 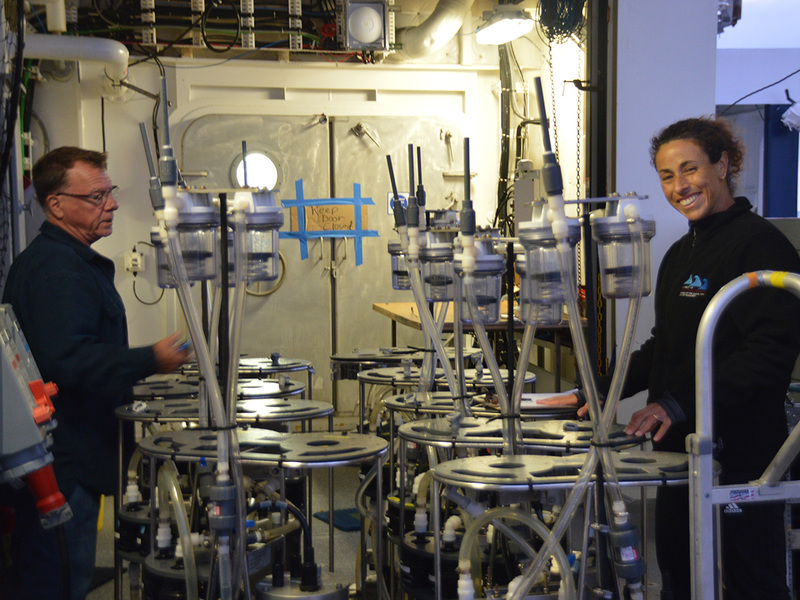 [10-Sep-18] Steve Pike and Claudia Benitez-Nelson prepare filtration pumps to be deployed. The pumps are equipped with filter heads that will collect marine particles from thousands of liters of seawater. The filters have different pore sizes, and the pumps and filters can be opened at specific water depths to collect samples specific to that portion of the water column. When the filters are collected after being deployed they are quickly processed (to minimize particle decay) and analyzed for microbial activity, pigments and carbon. Then, the filters are stored until they can be further analyzed in a laboratory at Woods Whole Oceanographic Institution.